Reflections of a Restless Mind | The world is your oyster. What will YOU do with it? I’m only a week into my inpatient solid oncology rotation, but an interesting pattern I’ve observed is a very palpable attitude difference between younger and older generations when confronting end of life care. The advent of palliative care and hospice has caused not only a huge paradigm shift in medicine, but also a shift in society’s views of death. As a physician who has seen death in hospitals, I appreciate how proliferative the media has been in publishing personal anecdotes to (1) inform the public about OPTIONS at the end of life and (2) to increase the level of comfort and awareness people have in discussing death and dying. I appreciate how health care providers have been eager to join in educating people about the dying process. I see younger generations accepting the choice of quality over quantity of life MUCH easier than older generations – perhaps because they are more aware, thanks to media. I’ve noticed in older generations an attitude that reflects how medicine used to be: back when there was still advances to be made, new technology to try out, and treatment was aimed to be aggressive. But, I think the younger generations are realizing that, as medicine has advanced and become more complex, a leap in medical knowledge has also revealed how close we are to the limits of our bodies and our mortality, in fighting with nature’s inevitable course. Hospice is an awesome and very much needed advancement in the way we practice medicine. I have confidence that in the next decade, it will be much better established and much better utilized. But, at least right now, every day as a physician I feel its growing pains. As it is still a relatively new idea, tremendous education and advocacy still needs to be done – both on the part of the physician and the ancillary staff. I was happy to see that the New York Times has a blog aimed to accomplish specifically that, to allow the public access to things we see every day. I highly recommend perusing their column, “The End”. One of the articles I would like to highlight is one written by a palliative care physician, on post-home-hospice set up follow up. For all my fellow healthcare providers, especially those who work in the inpatient setting, I think you will find this as humbling as I did. When we spend so much time in the bubble of our controlled, regimented hospital, we can forget about the complexity of caring for loved ones in the real world. Now that home hospice is an option, we get excited when we think we are making patients dignified by sending them to home hospice. And we are, but we can’t forget that EDUCATION is key. This article does a good job highlighting those complexities and issues that can come with information gaps – issues we should always keep in the back of our mind when we talk to patients. After all, we are trying to do the best to accomplish why we send patients to home hospice in the first place – to keep them comfortable, out of the hospital, away from invasive tests that will NOT help them, and instead, potentially cause them more harm and suffering. Without proper guidance, sending people to home hospice means they may very well come straight back, if the family doesn’t properly understand what it means. Read more in the original article found here: NYT: Dying at home when you are poor. And, in terms of a extremely reasonable option, I like this proprosal : Medicare Part Q? Theo is a friend I met through a medical school classmate, Laura. A bit over 18 months ago, Theo accepted a Peace Corps position teaching English and went from living in San Francisco to living in a remote village in the mountains of Tanzania. It was fascinating living vicariously through his facebook updates on village life: working with secondary school kids on their English during the week, and on various projects to improve the quality of life and income generating power of his school during the weekends (think rain encatchment, cows, chickens and beehives for honey!) . When I found myself with 2 months of vacation in my last year of medical school and no set itinerary, the thought popped in my head: why not take some time to experience Tanzania village life in person?! I knew I would be living in conditions different than America, and Theo warned me it would be quite a change, but I thought I knew what I was getting into. And for some of it, I guess I did? Since Theo had been in Tanzania for more than a year, he was almost a local, and I (in my sheltered, privileged, pseudo-hipster way) wanted my experience to be as close to the ‘local’ life as possible. After all, I could take any kind of inconvenience if it was only for a couple days! I was prepared to sit in long, crowded bus rides. I was prepared to deal with sweltering heat and mosquitoes. I was prepared to pay my respects to the squat pots. Theo lived in his school’s dorm building, which was actually quite nice–at least much nicer than the living conditions of some of his students–so even though I was prepared to sleep on the floor with bugs, I lucked out. I didn’t quite expect the lack of running water, or of internet, but could deal with that enough. I could even deal with the bucket baths 😛 Subconsciously, I didn’t care–again, I knew it was all only temporary. Growing up in a middle-class immigrant family in America, my childhood had no shortage of stories of a harder life. Whether it was labor in the Chinese countryside or odd jobs in Queens, NY, most of the time, these stories were to force us, extremely spoiled American children, to gain SOME perspective. But stories weren’t enough; it would be impossible to realize how privileged we were until we let go and walked among those less fortunate. Even with THOSE opportunities, which for me were working in homeless shelters or going to Mexico and Haiti, I still remained sheltered from the true meaning of poverty. Until I spent time in the direct shoes of the impoverished, what I thought I could understand of poverty would turn out to be just scratches on the surface. What I’ve realized makes it impossible for me to truly empathize with people less fortunate is the undeniable luxury I will always have (at least for now), of home. No matter how long (or how short) I spend in any area, I cannot deny that I have a home–not only in structure, but also in community–in abundant, free, middle class America. Of course, experiencing poorer places make me much more appreciative of the resources we do have, and they do lower my comfort threshold. I don’t care too much about sleeping on a quilted pillow top memory foam *insert designer brand here* mattress more than a bamboo mat on the floor (which my parents actually made me do for a while, for my back). However, it has hit me that as long as I am an American, I will always have more than a larger part of the world. At the bare minimum, I am an American citizen, and I have access to running, clean water, and food stamps. But though I can never full understand poverty, I do think it’s important to understand as much of it as possible. Why? At least for me, I’ve realized that the difference between hearing about poverty, having an indirect experience and having a much closer experience, is in the strength of my conviction to do something about it. At its root, poverty is still relative. In order to fight poverty, you have to fight inequality. To fight inequality, you have to first recognize the magnitude of the divide. Perhaps I never felt this way before because, looking back, I’ve never been very close to the far other end of the spectrum. When my church volunteered at a border town in Mexico, where the roads were unpaved, the houses were made of wood scraps and tin, and water had to be transported, we lived in an air conditioned guesthouse with a POOL. Even when I went to Haiti, this time as a medical volunteer, my team and I stayed in a slightly less glamorous but nonetheless spacious, multiroom house with toilets and a shower(!). Sure, we were less comfortable than we would have been in America, but we were EONS more comfortable than the people we saw in our clinic. We didn’t NEED to have those comforts, but, because we were American, steps below our ‘comfort zone’ were still miles above the communities we served. I didn’t notice it at the time, but I definitely remained sheltered. Regardless of where we were, there remained a dramatic contrast between the places we, the volunteers, stayed, and they, the community, lived. I realized this when I got a humbling wake-up call during my visit to Theo’s village in Tanzania. From my experience, I learned three major lessons: 1. it is impossible for me to completely understand poverty 2. it does not take much to be happy and 3. life is objectively unfair; if we have excess, we should use it to reduce disparities. In being ‘prepared’ for ‘Tanzanian life’, I think what caught me the most by surprise was how ridiculously and extravagantly I was oblivious to the point; I was incredibly successful at making myself a super-alien (major lesson #1). First of all, I realized how ironic it was that, if my goal was to understand local life as much as possible, my preparation for Tanzania was preparation AGAINST heat and mosquitoes and scarcer toilet/shower conditions–the exact things villagers experienced every day. Comically, the first night in Tanzania, my heart rate went up to at LEAST the 100s because I was terrified of getting robbed during our 8+hour bus ride. When we got stopped by police looking for bribes on a taxi to Theo’s friends’ village, my first fear was of course, for our safety. But then it followed that, in a place where people burn their trash and have no street lights, not to mention ‘streets’, I was this Asian American girl afraid of losing two gigantic backpacks full of DEET, *special* quick drying clothes sprayed with permethrin, extra batteries, outlets and converters…and who can forget, my $2,000 camera? …basically, I had a fear of losing my sac of “How to feel as American as possible in Africa”. Ha! My 5 days in Theo’s area of Tanzania, a village called Moa, near Lushoto, was short, but it was enough to make me realize how excessively I had prepared, how attached I was to my stuff, how much more stress STUFF was causing, and how wrong I was about my own thoughts on poorer communities. For one, Theo’s village lived on much less than people do in America, but they weren’tfighting to live (major lesson #2). His community was poor, but not destitute. True, people worked a lot harder, but they also understood the rewards of hard work, and I was glad to see that most of the villagers had most of their basic needs met. It was encouraging to see how people warmly greeted one another while passing on the road. It was hilarious to see 5 year old kids show me up on a steep section of mountain as they passed me easily, carrying firewood on their heads, as I fought to catch my breath. It was fascinating to see agriculture, chickens and cows everywhere. But don’t get me wrong; poverty, when not absolute, is always relative. Nothing could have controlled for Theo or I to be born in America or Theo’s students to be born in Tanzania, except that, it just happened that way. With all the money my American self threw into my flight to Tanzania, visa fees, water purification tablets, travel insurance (including medical coverage), sunscreen, and everything else, all to make sure I, of 1, was virtually indestructable in my 5 days in Africa, I could have probably made a major contribution to any part of the infrastructure in Theo’s village, of at least 100(?50? ), to deal with chronic impacts of poor nutritional status, health access, sanitation, educational access (especially for those kids carrying firewood), and social mobility (major lesson #3). Inequality was never so clear. My stay in Tanzania reminded me of an op-ed article I read a couple years ago in the NYT, about an author’s experience with extravagance, disillusionment, travelling, and eventually, realizing the importance of experiences, not things (living with less). I remember (audaciously) patting myself on the back for agreeing with everything covered in the article, but I realize now how oblivious I was to truly embracing the concept of experiences over things, to truly living with the bare minimum, and to truly making good use of excess to eliminate disparities (now, if only we can fix corrupt governments…). Thanks to the unique opportunity to see life in an agrarian village through the eyes of an almost-local, at least I can say I now have a better understanding of living at another end of the spectrum (though still nothing compared to Theo or other long term volunteers in developing countries!). Theo has done an incredible job adjusting to Tanzanian life and trying to understand and work with the needs of his community; he educated me thoroughly about the realities of his school and village resources, the misconceptions foreigners have, the subtleties of the culture, and the beauty he has found in a simpler life from his experience in Tanzania. However, it cannot be denied that even he has the luxury of coming back to America soon; his Peace Corps experience has an end. That is why actions to make communities more sustainable are so important: our goal as more privileged people is not to give things, but to give ideas and empower a community so we can all work together towards reducing disparities. So, where to go from here? Going to Tanzania was a decision that I almost didn’t make, but I am incredibly glad I did. Sure, there were some nerve-wracking parts of the experience, mostly because I had no idea what different culture I was stepping into. Theo was awesome to accompany me the whole time so I felt safe. Sure, if I were to live in Theo’s village or the equivalent long term, inequality would minimize not only socially, but also medically as well: I can see how conditions endemic in developing countries, such as malnutrition/malabsorption, parasites, malaria/yellow fever/other mosquito borne illnesses, and respiratory issues associated with burning plastic or cooking with charcoal in enclosed environments could rear their heads. Sure, there are many other things to consider when one makes the decision of on the field, or off the field? Am I going to just let this experience stay as a memory, slowly fading into the bucket of other experiences I aim to have before I die? Or do I use this as an impetus to action, and if so, what action? One thing I know for certain is that I’ve left Tanzania humbled, with a much stronger recognition of inequality, and a much stronger conviction to do more about it. At the very least, from this trip, I want to pursue more opportunities to better understand the needs and struggles of poorer communities, and continuing thinking of ideas to eliminate disparities. I want to seek more opportunities to live closer to the local people. I’m pretty embarrassed to say that the next leg of my trip is to Dubai, one of the richest countries in the world, but at least it will sear these concepts of disparity even deeper in my mind. Theo seriously organized the PERFECT experience in his home away from home for me, far better than I would have imagined. I even got to see a local hospital in his town, quite well outfitted with male and female wards, and special rooms for outpatient visits, family planning, and children. However, I could also see how a similar hospital environment in West Africa bred Ebola like wildfire, and how there are constant shortages of supplies, potentially staff (if the hospital was filled to capacity), and opportunities to hand wash (:(!). In about a month, I will hopefully have a similar experience working in another village, but this time in rural China, to help train the locals to do basic medical techniques (think BLS, neonatal rescuscitation after home births, basic management of respiratory issues, etc). I have faith that every experience I have is far from being in isolation; I pray that both these experiences, as well as my continued interest in research, and cancer, will give me some more clarity about what to do with these stronger convictions. Lord, give me boldness to go where you want me to be. PS: more pictures and details in the works! People say they’re hungry for knowledge, and I’ve always wished I could say the same without feeling like I was lying. Sure, I love learning and what a gift it is to be both a learner and a teacher, but I have struggled with knowledge. I don’t crave it like good students do. I am hungry for love—and I’m not talking about romance. I am hungry to love you, and everyone else. I don’t always feel this way—I’m not claiming selflessness, but this is the ultimate theme driving my life. I only feel fulfilled in life when mine is actively demonstrating love. I’m starving when I’m not extending or receiving it. I am hungry for love that welcomes, engages, nurtures, and frees. And so, my desire is for a specific branch on this tree of knowledge. Knowledge with a purpose—that’s the only kind I’m after. Wisdom values knowledge, but not on the basis of itself. I’m not interested in knowledge alone. I want to grow in knowledge because as we shed ignorance, opportunities to utilize our knowledge in ways of love allow us to be a gift. And being a gift means having more to offer than a good GPA. Our external form encases heart and mind, so being a gift to this world means using both for the benefit of others. Heart—the source of compassion; mind—the source of action. Compassion is where justice and mercy collide and wisdom is learning how to balance between the two. This is a worthy pursuit. I’m a daily seeker and gatherer of knowledge that equips me to feed a deeper hunger. I want to feed my brain to mature my heart; I want to feast on knowledge that builds my character. Maybe this is why I struggle to make time for things that don’t immediately gratify my pursuit of love. Maybe this is why I’ve been such a mediocre student all my life—struggling to care about generic knowledge that I couldn’t connect with. I’m sure if I pondered this long enough, I’d realize that all knowledge can equip me to love in some way or another, but that’s hard for me to accept when I think of the power-points and deadlines. I have a deep appetite to grow in knowledge that awakens my understanding of people’s needs, emotions, longings, fears, and struggles. I crave the knowledge that strengthens an awareness of injustice, inequality, and suffering so I can know the oppressed and stand against the oppressor. I want to know the brokenness so I can be a propelling force towards healing; I want to know truth so I can live as a banner exposing the lies. People say they’re hungry for knowledge, but be specific. What is it you want to know, and why do you want to know it? Knowledge without application is powerless. Knowledge without love is empty. Knowing without growing is worthless because it generates potential without implementing purpose or cause. Macarons are one of the few desserts every person…or at least every female…seems to be absolutely crazy about. Unfortunately, satisfying this desire can get quite expensive. In all fairness, I realized after trying to make them that the cost is not all THAT inflated. First of all, a key component of macarons is almond flour, which is really hard to make on your own at the consistency required for good looking macarons. Almond flour/meal by the pound is pretty expensive by itself. Plus, add the delicate flavorings, and the reputation of these cookies for being extremely temperamental, and you can see why these are a ‘delicacy’. BUT the good news is that many bloggers (and people in general) have tried recreating these cookies in their homes, to great success, and sharing them online 🙂 So making them yourself is totally and completely possible. When I went to Canada to visit my cousin this weekend, he brought up the idea to make macarons. He had tried them once but failed to get ‘feet’ (the little puffed layer on the bottom of macarons), and was eager to try again. I can’t say no to making macarons! For the recipe, we used a combination of tips and ingredient proportions from Bake at 350, Food Nouveau, and FN’s SUPER comprehensive troubleshooting guide to making macarons. 2. …sift the almond flour and powdered sugar, to eliminate clumps that will collapse air pockets within the egg whites and make for smoother cookies. This definitely helps. 4. …carefully NOT overmix when adding the almond/powdered sugar ‘flour to the egg white mixture. The key is to mix JUST enough so that the dry ingredients are JUST incorporated. 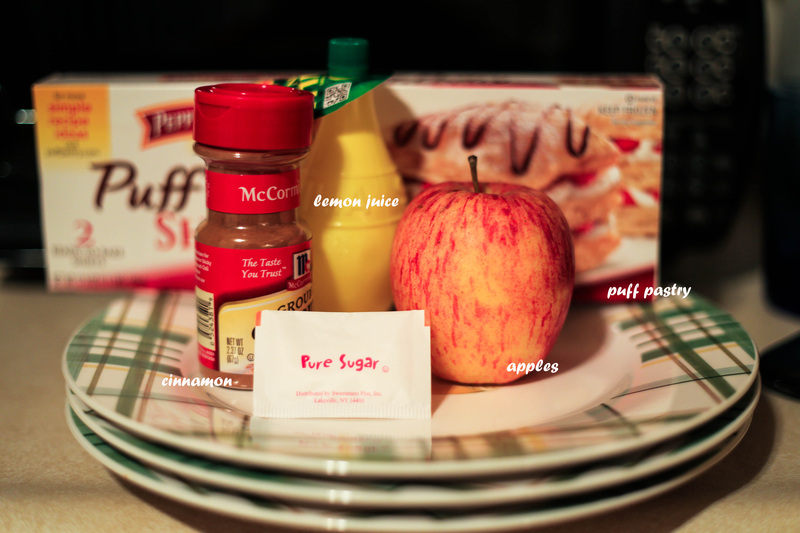 The two recipe links explain the process quite well. I usually use anywhere from 10-20 strokes. Don’t worry about not mixing enough because as long as the ingredients are JUST incorporated, they will mix together in the pastry bag you end up using to pipe the cookies out (or, in my case, a gallon-sized ziplock bag with the corner cut off). 6. …be careful not to overbake! Usually as soon as the tops are hard and the feet have formed, the cookies are ready. When we made these, 11 min at 300 F was perfect. If you find yourself with some food coloring and want to add some flair to your macarons, you can take a small paintbrush or rolled up piece of paper, dip it in food coloring, and then ‘paint’ the macarons to your desire! Again, for full recipes and tips, check out Bake at 350, Food Nouveau, and FN’s comprehensive troubleshooting guide to making macarons–they all are great guides with awesome comments and beautiful photos to match! 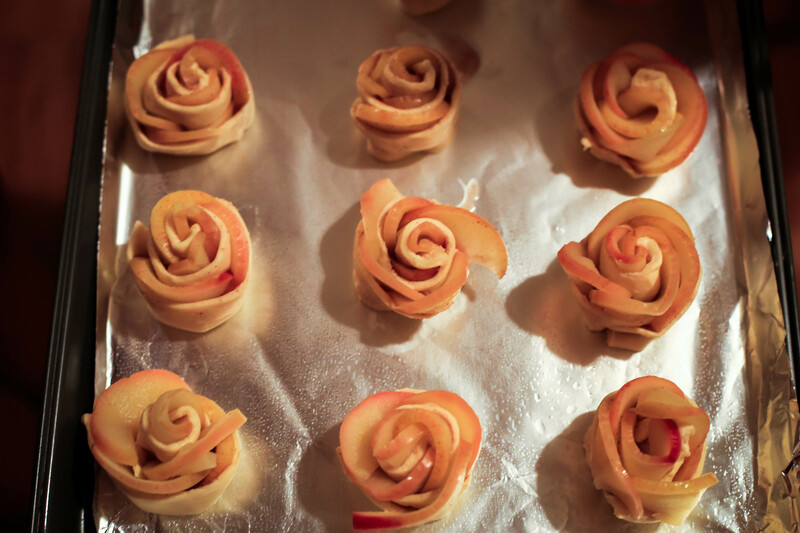 This is a very belated post (made these apple roses about 4 months ago, when apples were all the rage), but since Valentine’s day is reminiscent of roses, what better time to (finally) post up the recipe than now? 1. 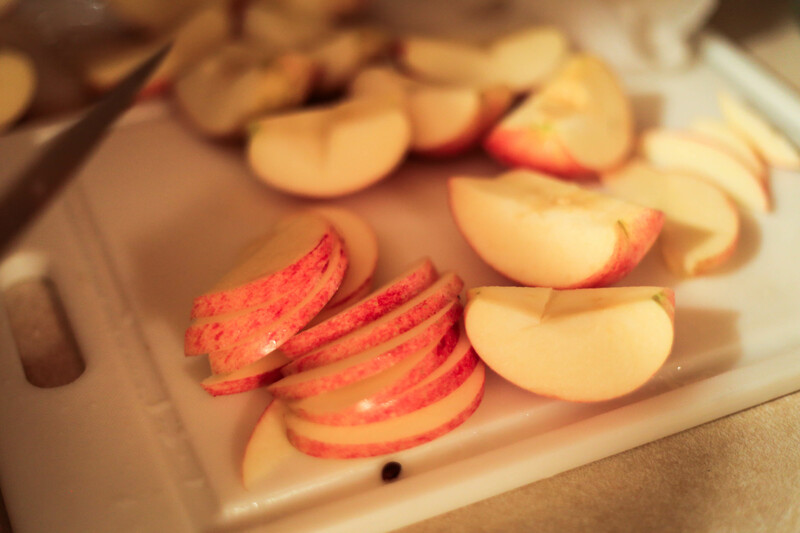 Wash the apples, cut in half, core, then slice in very thin slices, slightly smaller than 1/8 inch. 2. 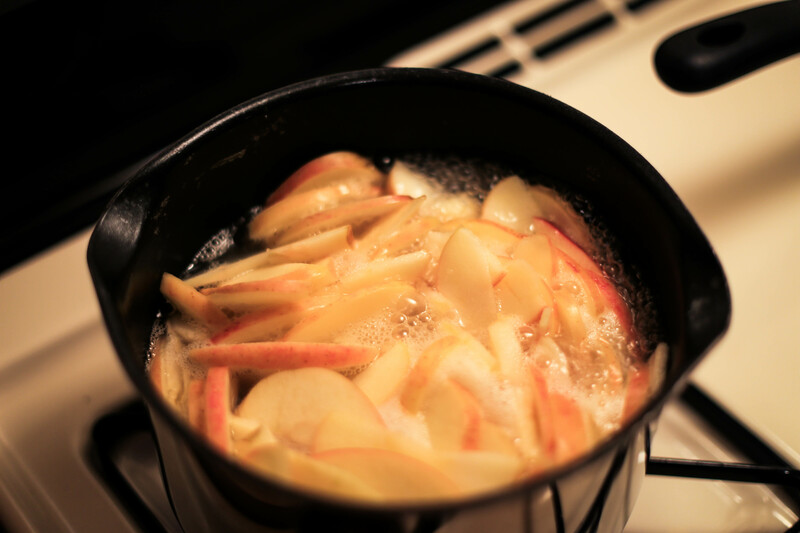 In a saucepan, bring the 4 cups water, sugar and lemon juice to a boil and place the apple slices in. 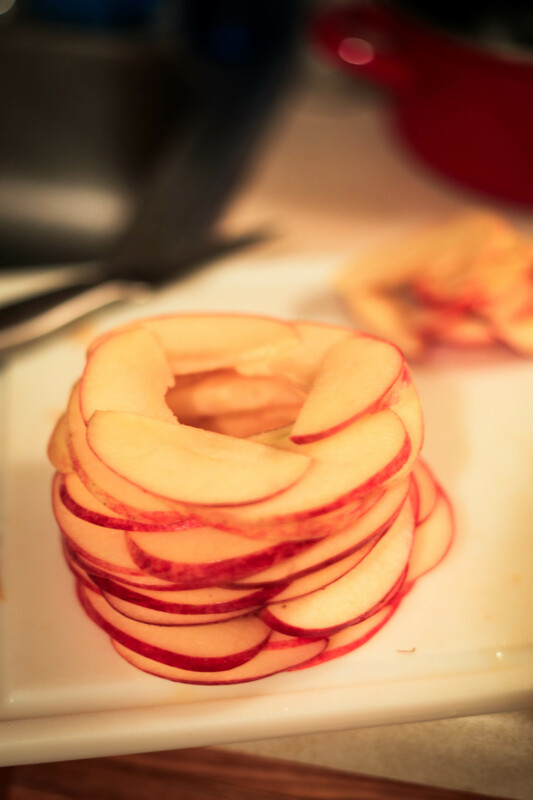 Boil for 2 minutes, or until the slices soften and you can easily bend them. 3. 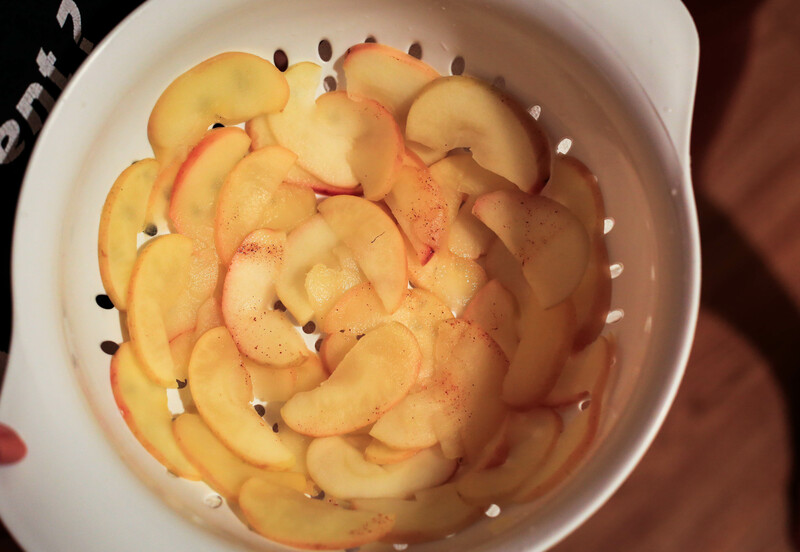 Have a colander and a bowl close and when the time is up, fish the apple slices with a slotted spoon and let them cool, then dry in the colander. 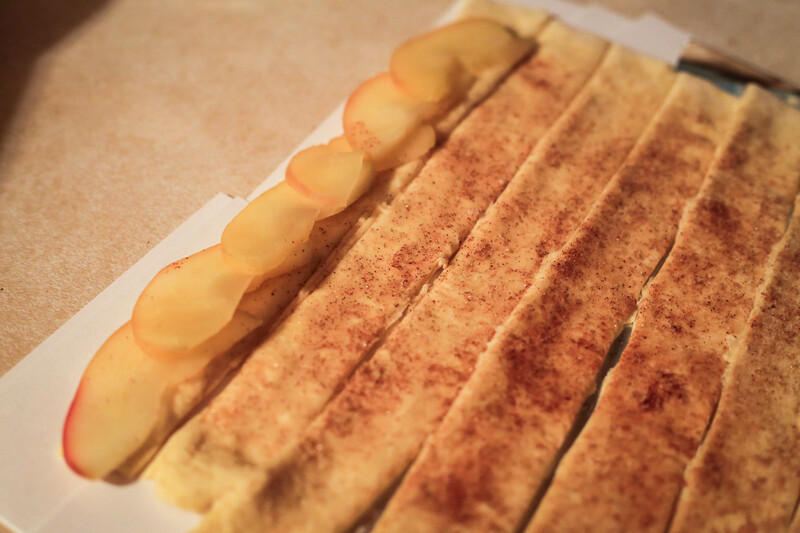 Optional: Arrange the apple slices on paper towels to cool down completely and also dry up a bit. 4. Prepare your work surface by lightly sprinkling it with some flour or just use a silicone mat and lay the puff pastry sheet down. 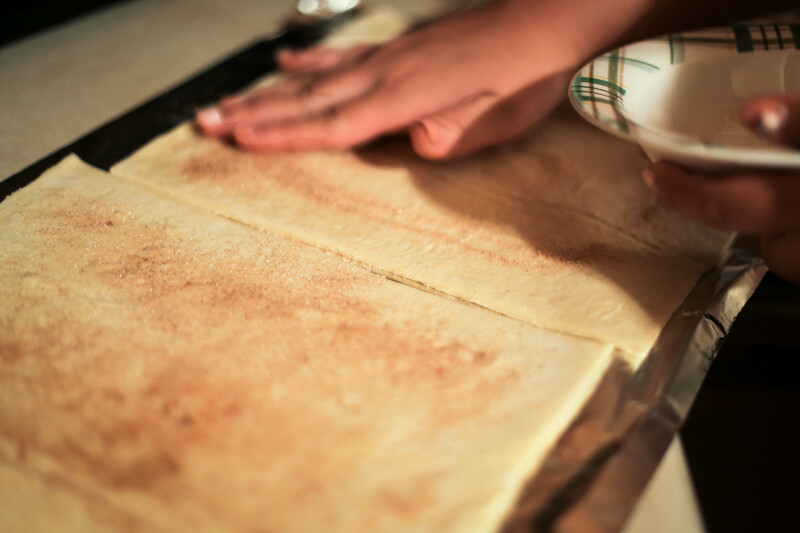 Mix the sugar and cinnamon together and evenly spread it over the pastry sheet; press down to secure. 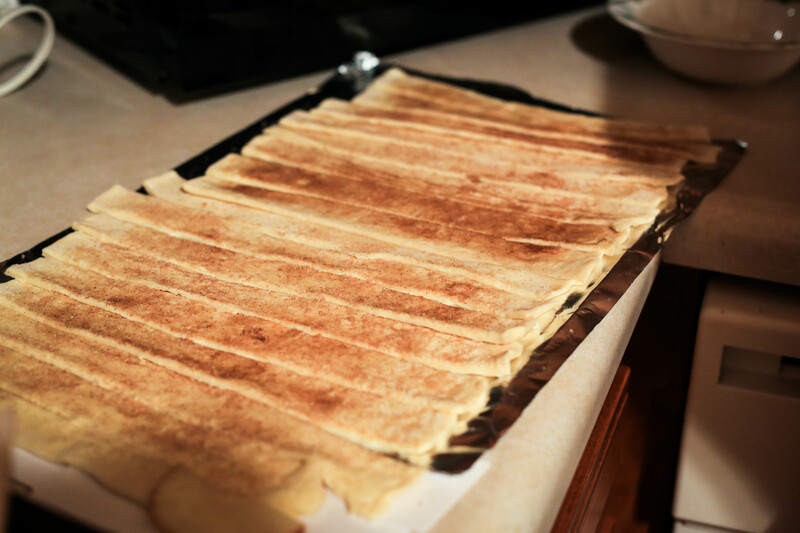 With a pastry cutter or knife, carefully cut long strips, approximately 1/2 inch wide, from the puff pastry. 5. Preheat the oven to 425 F.
6. By now, your apples should be cool and almost dry. 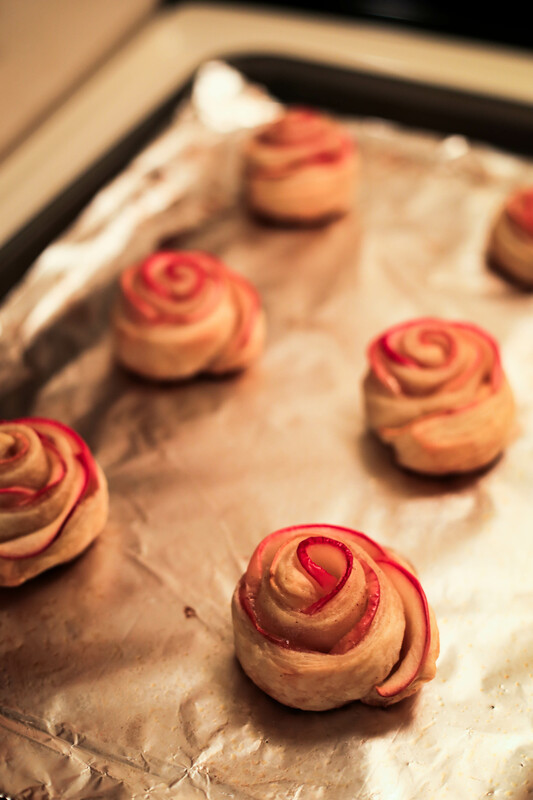 Take a few slices and place them on the strips, overlapping them so they do not fall out and also make the rose-like design (petals) of the finish product. 7. Bake for 25 minutes, or until nicely golden. When you take them out, let them cool for about 5 minutes. Optional: sprinkle some cinnamon and powdered sugar on them before serving. While making these cookies and crafting a blog post in my mind, I realized that all the cookie recipes I’ve posted on this blog have been white chocolate chip recipes…the white chocolate cranberry blood cell cookies, white chocolate peppermint cookies, and now red velvet white chocolate chip cookies. Ironically, I don’t even normally like white chocolate (on its own)! If I had a choice, I definitely prefer darker, more bitter and more complex chocolates…think dark chocolate with sea salt +/- caramel, or spicy, or fruit flavors. 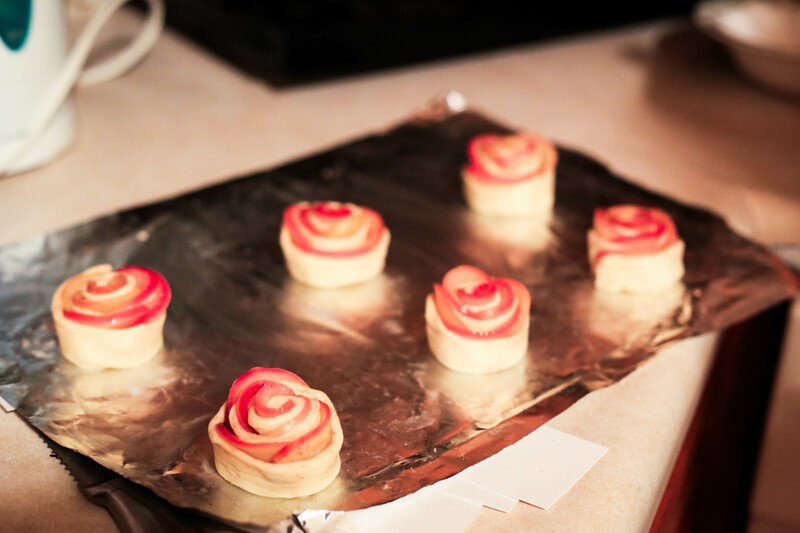 There is the more involved way to make red velvet cookies, and then there’s the lazy way…by using cake mix! The recipe I used for these cookies are a variation of the butter + egg + cake mix cookie magic that lies secretly in every baker’s kitchen. Most recipes using cake mix for cookies will ask you to get the cake mix for that cookie (i.e., red velvet cake mix for red velvet cookies, chocolate cake mix for chocolate cookies, etc) but since I had a lot of red food color and cocoa powder on hand, I decided to made the ‘red velvet’ portion from scratch. In the end, I think it worked quite well. 2. Beat the butter until smooth. Beat in the egg and vanilla. 3. Add the cake mix and beat until well combined. *In my case, I didn’t have red velvet cake mix so used 1 box butter yellow cake mix, 3 drops of red gel food coloring (more concentrated than regular food coloring) and 1/4 cup cocoa powder. 5. Roll tablespoonfuls of dough into balls and place on a parchment lined baking sheet. 6. Bake for 10 – 12 minutes or until the top is set, but the center is still gooey. Stay posted for more Valentines-day themed desserts :)! Today marks the release of the 2014 World Cancer Report and World Cancer Day! “[Most striking from the report is the prediction that] new cancer cases will rise from an estimated 14 million annually in 2012 to 22 million within two decades. Over the same period, cancer deaths are predicted to rise from 8.2 million a year to 13 million. Also, apparently “The International Cancer Genome Consortium (ICGC) today announced that it has made available to the scientific community data from more than 10,000 cancer genomes. The data can be used by cancer researchers around the world to better understand the genomic basis of cancer, accelerate cancer research and aid in the development of more targeted treatments.” <–this is HUGE!! …therefore, strive for PROGRESS, not perfection. Thankfully, I knew I couldn’t keep that mindset for long. People do not function by operating at extremes, either the extreme right or the extreme left. I know I wasn’t happy trying to be perfect, but I still got stuff done, and I was DEFINITELY not happy NOT doing anything. Early on 1st year of med school, failing embarassingly on a project I signed up for taught me an important lesson: I needed to learn to say NO. I needed to learn my limits, learn to prioritize things I can do and forget things with low yield, and find that balance between underwork and overambition. In short, I needed to learn to be MATURE. Self discipline is something many people struggle with, but that doesn’t mean we shouldn’t struggle to keep up with it. Self discipline is a vital skill in order to progress in life. It is also the bane of my existence. However, I learned the hard way that ignoring self discipline and trying to do windsprints to nowhere gets you to precisely that location: no where. Training for a half marathon was my first practice in self discipline and literally changed my life. I went from thinking I could never run more than 2 miles to running 13.1, from having no $$ to raising $1400 for cancer with the help of awesome friends and family, and realized that when there is a will, there IS a way. That way just means a PLAN, and what one needs to remember is that you NEED to have a plan, not just a will. Two articles I read at the end of 2013 were reminders of my need to continue to progress on this life lesson of self discipline. I realized in 2013 that it is ok to have dreams, and you CAN reach them, but you need to be kind to yourself during the process and KNOW YOUR LIMITS. Make realistic dreams, so that 1. You can actually reach them and 2. You can go beyond them when you do reach them! Two articles from waitbutwhy, on how to beat procrastination, and the Business Insider, on the secret behind Google’s productivity, were extremely useful in helping me establish this plan to accomplish my resolution for this upcoming year: to be consistently PROGRESSIVE. Progress does NOT happen overnight, but huge progressions in society DO occur OVER TIME. That’s all they need: time, and patience. No, I’m not going to be able to post 10 blog entries in a matter of one month, but, if I consistently progressively post at LEAST a couple a month, over the course of the year I have this whole collection of posts that didn’t take that much effort to begin with! So there lies my new years resolution (albeit 2 months late :P). Yes, there are many more specifics, but my main resolution this year is to strive for PROGRESS, in multiple areas of my life, and not get discouraged by PERFECTION. It’s not going to happen overnight, but at the end of this year, I want to look back and be proud of the progress, whatever size it is, that I’ve made with self discipline. Cheers to an equally awesome 2014–the year of the horse! 新年快乐!